www.bookandborrow.com (herein referred to as book&borrow) and its associated services are provided to you by “book&borrow”. By using, visiting or browsing the book&borrow website, becoming a subscriber of book&borrow services or purchasing a product from book&borrow, you agree to be bound by all of the following terms and conditions. 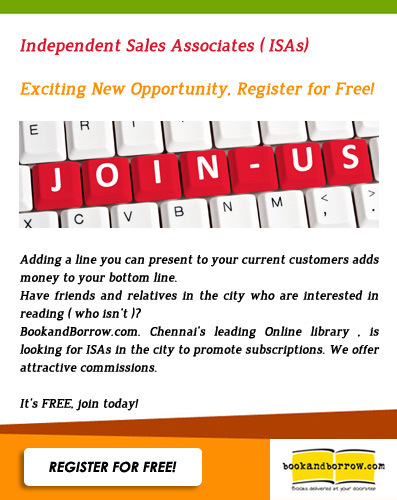 The book&borrow service provides subscribers/customers the opportunity to rent books online. Customers can browse the online catalog and create their own Book Queue & Favorites list. The Book Queue is the "Rental Queue" that governs what books you would like to read – and this is what gets shipped to you from book&borrow. The books customers like to read are then delivered to them & subsequently picked up. book&borrow recommends that you have at least 10 books in your Book Queue. Customers can choose from the various plans available from book&borrow. The choice of the plan determines the number of books shipped, frequency of shipment & the rental charges. For monthly subscribers, when book&borrow receives a request for delivery, the books are chosen from the Book Queue (governed by your subscription plan) and sent. This is subject to availabilty and the customer will be intimated in case books are in circulation and unavailable for shipment at the time. Once the customer reads the book & schedules a pickup, the next set of books are chosen from the Book Queue and sent. Books will be shipped from the Book Queue depending on the availability of the book. If by order of priority and certain title is unavaiable at the time of shipment, the next available title will be shipped. 1. Membership: After becoming a book&borrow subscriber, you are responsible for paying periodic subscription fees OR pre-book rental fees according to the then current billing terms. Subscription fees are non-refundable. A one time refundable deposit (Rs. 300/-) is also mandatory to cover incidental loss or damage to book&borrow property. If a member does not claim the refundable deposit or renew the membership within a period of 6 months of the expiry of their membership, the due amount will not be refunded to the member. 2. Billing: A subscriber will be billed a flat fee, plus any applicable sales/service tax, at the beginning of each subscription period. The subscription fee will be billed at the beginning of your subscription and on each biannual renewal thereafter unless and until you cancel your membership. All fees and charges related to the subscription plans are non-refundable and there are no refunds or credits for partially used periods. We may change the fees and charges in effect, or add new fees and charges from time to time, but we will give you advance notice of these changes by email. On cancellation of your membership, and in the event that there are no deductions towards loss of or damage to property, your security deposit will be refunded. 3. Changes in Membership Plans: A subscriber may upgrade plans at any time. Please contact support@bookandborrow.com for membership plan changes or use the option available on your account page. The difference in the subscription fee will be calculated for the remaining months of your subscription and charged to you accordingly. If you wish to downgrade your plan you may do so only after your 6 month period expires. 4. Cancellation: Your subscription may be cancelled at any time. These cancellations take effect immediately if you do not have any books in your possession. Otherwise, the cancellation will become effective once all book&borrow books in your possession are returned. In the event that you do not return the books within seven (7) days, you will be charged the book's actual retail cost. We don't provide refunds or credits for any partial-month subscription periods or unread books. The deposit refund will be given by way of cheque payable in Chennai. 5. Damaged Books: All of our books are sent and returned in a protective bag. If a book is returned to book&borrow damaged as a result of subscriber misuse, book&borrow will charge you the cost of each damaged book. However, if book&borrow determines that a book was damaged during transit, book&borrow will not charge you for the damaged book. However, you should note that a subscriber is allowed only one no-fault missing/damaged book shipment during the course of his or her membership. Any further instances of claimed missing or damaged book shipments will be charged to the subscriber. 6. Automatic Renewal: Subscription fees are automatically renewed, and therefore the member is liable to pay the subscription fees in a timely manner. In case the member, for whatever reason , is not desirous of continuing then the member should write in advance about the same and have the pending books Pick Up done on or before Date of Expiry . A maximum grace period of Seven (7) days is permitted after the date of expiry to retain the books.Failure to do so within Seven days makes the member liable for the cost of those book(s) plus 50% of that cost as a handling charge, for which book&borrow reserves the right to charge the Member's refundable security deposit. 7. Invitations and Special Offers: Invitations and special offers are available only for first-time book&borrow subscribers, unless otherwise expressly stated in the offer. Once redeemed, all promotional offers are final and are not eligible for refund or return. 8. Shipping Policy: book&borrow manages its logistics in partnership with a logistics provider. book&borrow will ensure that your order is processed the same day as you place the order (except Sunday). Books will be delivered within 3-4 working days of placing the order. The books shipped will be governed by the availability of the book in book&borrow's inventory. 9. Book Queue (Book Queue): We endeavor to ship to you the books listed highest in your queue; however when availability is limited, we may ship you books lower on your queue. Adjustments made to your queue may not immediately impact your next shipment. In certain instances you may have adjusted your queue before you have received a shipment message when in fact a shipment was already processed. The adjustments will, however, impact subsequent shipments. In the event that a book is in circulation, the customer will be intimated and will have the opportunity to remove the book from the queue or to move it to the Favorites list. 10. Book Allocation: book&borrow reserves the right to allocate and ship books among our subscribers in any manner that we, in our sole and absolute discretion, determine. In addition, we will, in our sole and absolute discretion, determine the quantity of books we purchase for any particular title and the level of staffing and number of shipments to be processed at each distribution centre. As a result, we may not always send you the top choices from your queue, and we may not ship out your next book(s) on the same day that we receive one from you. At present, our goal is to ship you the book(s) listed highest in your queue. Often, on the same day that we pick up a book(s) from you, we will deliver the next available book(s) from your queue. In certain instances, your next available book(s) will not ship until at least one business day following our receipt of your returned book(s). 11. Return: book&borrow reserves the right to request return of any and all book(s) in the possession of Members at any time. Members understand and agree to promptly return any book(s) to book&borrow upon request, and that failure to do so within seven days of the request makes Members liable for the cost of those book(s) plus 50% of that cost as a handling charge, for which book&borrow reserves the right to charge the Member's refundable security deposit. Customers are given the option to indicate when they are ready to return the books they have borrowed and accordingly schedule a pick up. This is a free service provided by book&borrow, however, in the event that at the scheduled time of delivery/ pick-up, the customer is unavailable, and another pick-up service has to be scheduled, the cost of the courier service will be charged to the customer. 12. Book Content: book&borrow has put in effort to create a catalog of your favorite books and categorized them for ease of access. The cover images & book description are procured from third party/publishers and book&borrow takes no guarantee of the accuracy of such content. You might receive a book that has a cover different from what was shown online. This is because different publishers of the same book use different cover images. Best efforts have been taken to deliver the goods described on the site; the company takes no guarantee that the book will bear the exact cover produced on the site. The books are subject to availability and the presence of multiple copies of the same book from multiple publishers may result in a disparity between the cover shown on the site, and the book delivered. Despite this, the content of the book would be the same. Copyright : All contents included on the book&borrow website and delivered to you as part of the book&borrow services, including the books themselves, are the property of book&borrow, its suppliers, or its advertisers, and are protected by Indian and international copyright laws. The compilation of the content on this website is the exclusive property of book&borrow, and protected by Indian and international copyright laws. Trademarks: book&borrow, book&borrow.com, The book&borrow logo, and all page headers, custom graphics and button icons are service marks, trademarks, and/or trade dress of book&borrow. All other trademarks, product names and company names or logos cited herein are the property of their respective owners. You must be eighteen years of age or older to subscribe to the book&borrow service. The book&borrow website and its content are for your personal, non-commercial use. book&borrow grants you a limited license to access and utilize the book&borrow website for that purpose only. You may not download, copy, distribute, transmit, display, perform, publish, license, create derivative works from, or offer for sale any book&borrow content without its express written consent. book&borrow's trademarks, service marks and trade dress may not be used in any way without prior written approval from book&borrow. You agree to use the book&borrow website and any associated service in accordance with all applicable laws, rules and regulations. book&borrow reserves the right to immediately terminate your limited license to utilize its website as a result of any unauthorized or illegal use, the contents of its website, and/or any associated service should book&borrow become aware of that unauthorized or illegal use. This right to terminate includes, but is not limited to, book&borrow's right to terminate your subscription if it determines subscriber abuse of book&borrow's policies and procedures. book&borrow will cooperate with legal authorities and private parties investigating claims of illegal activity. book&borrow cooperation may include identification of you and other data relating to the use of the website. If such information is requested, you hereby authorize book&borrow to release any and all information, provided that it uses reasonable efforts to identify and provide you with notice of such request (if permitted by law). You are solely responsible for maintaining the confidentiality and security of your account information and your password. If you reveal your password or share your account with anyone, you take full responsibility for his/her actions. This website may include inaccuracies or typographical errors that may be corrected as they are discovered at book&borrow sole discretion. book&borrow reserves the right to terminate or restrict your use of its website or any services it provides, without notice, for any reason, or no reason whatsoever. However, this does not mean that book&borrow has undertaken an obligation to supervise or police your activity on its website. book&borrow distributes content supplied by third parties. book&borrow is not a publisher. book&borrow has no more editorial control over content supplied by third parties than does a public library or newsstand. Any opinions, advice, statements, services, offers, or other information expressed or made available by third parties, including third party content providers, advertisers, merchants, sponsors, licensors, or any other user of book&borrow are those of the respective authors or distributors and not of book&borrow or its affiliates, or any of their respective officers, directors, employees or agents. book&borrow does not guarantee the accuracy, completeness, or usefulness of any content, nor its merchantability or fitness for any particular purpose. It is your sole responsibility to evaluate the information, opinion, advice, and/or any other content available through book&borrow. You consent to receive electronic communications from book&borrow. You agree that any communication, notice, agreement, or disclosure that we send to you electronically satisfies any legal communication requirements, including that such communications be in writing. The book&borrow website may contain hyperlinks or banner advertisements that navigate a user to another website not controlled by, or affiliated with, book&borrow. In addition, other websites may link to the book&borrow website. book&borrow has not reviewed these websites and is not responsible in any way for these websites, or any of their content. The book&borrow website contains robot exclusion files, and you agree that you will not use any robot, spider, other automatic device, or manual process to monitor or copy our web pages or the content contained herein without our prior express written permission. You agree that you will not use any device, software, or routine to interfere or attempt to interfere with the proper working of book&borrow's website. You agree that you will not take any action that imposes an unreasonable or disproportionately large load on our infrastructure. In order to provide easier access to your account, book&borrow may place a small text file (known as a "cookie") on any computer from which you access the book&borrow website. If you return to the book&borrow website from that same computer, the cookie enables book&borrow to recognize you, without the need for you to sign in to your account. book&borrow does not knowingly collect any personally identifiable information from children under the age of thirteen. book&borrow's website and its services are directed to adults|, and when a user discloses personal information on this website, the user is representing to us that he or she is at least eighteen years of age. THIS WEBSITE, ITS CONTENTS, AND ANY SOFTWARE, PRODUCTS, AND/OR SERVICES OFFERED OR CONTAINED HEREIN ARE PROVIDED ON AN "AS IS" BASIS AND ON AN "AS AVAILABLE" BASIS. BOOK&BORROW MAKES NO REPRESENTATIONS OR WARRANTIES OF ANY KIND WITH RESPECT TO THIS WEBSITE, ITS CONTENTS, OR SUCH SOFTWARE, PRODUCTS AND/OR SERVICES, AND DISCLAIMS ALL SUCH REPRESENTATIONS AND WARRANTIES, INCLUDING, WITHOUT LIMITATION, WARRANTIES OF MERCHANTABILITY AND FITNESS FOR A PARTICULAR PURPOSE, NON-INFRINGEMENT OF THIRD PARTY RIGHTS, ERROR-FREE OR UNINTERRUPTED SERVICE, ACCURACY AVAILABILITY, RELIABILITY, SECURITY, CURRENCY AND COMPLETENESS ARISING FROM OR RELATING TO THIS WEBSITE, ITS CONTENTS OR ANY LINKS, ANY SOFTWARE, TOOLS, TIPS, PRODUCTS OR SERVICES PROVIDED THROUGH THIS WEBSITE. IN ADDITION, BOOK&BORROW DOES NOT REPRESENT OR WARRANT THAT THE INFORMATION ACCESSIBLE VIA THIS WEBSITE IS ACCURATE, COMPLETE OR CURRENT. PRICE AND AVAILABILITY INFORMATION IS SUBJECT TO CHANGE WITHOUT NOTICE. IN NO EVENT SHALL BOOK&BORROW, ITS AFFILIATES, AND ANY OF THEIR RESPECTIVE PROPRIETER, DIRECTORS, OFFICERS, EMPLOYEES, AGENTS OR OTHER REPRESENTATIVES BE LIABLE FOR ANY DIRECT, INDIRECT, SPECIAL, INCIDENTAL, CONSEQUENTIAL, PUNITIVE OR AGGRAVATED DAMAGES (INCLUDING WITHOUT LIMITATION DAMAGES FOR LOSS OF DATA, INCOME OR PROFIT, LOSS OF OR DAMAGE TO PROPERTY AND THIRD PARTY CLAIMS) OR ANY OTHER DAMAGES OF ANY KIND, ARISING OUT OF OR IN CONNECTION WITH: THIS WEBSITE; ANY MATERIALS, INFORMATION, QUALIFICATIONS AND RECOMMENDATIONS APPEARING ON THIS WEBSITE; ANY SOFTWARE, TOOLS, TIPS, PRODUCTS, OR SERVICES OFFERED THROUGH, CONTAINED IN OR ADVERTISED ON THIS WEBSITE; ANY LINK PROVIDED ON THIS WEBSITE; AND YOUR ACCOUNT AND PASSWORD, WHETHER OR NOT BOOK&BORROW HAS BEEN ADVISED OF THE POSSIBILITY OF SUCH DAMAGES. THIS EXCLUSION OF LIABILITY SHALL APPLY TO THE FULLEST EXTENT PERMITTED BY LAW. THIS PROVISION SHALL SURVIVE THE TERMINATION OF YOUR RIGHT TO USE THIS WEBSITE. Applicable law may not allow the exclusion of certain warranties or the limitation or exclusion of liability for incidental or consequential damages. Accordingly, some of the above limitations or exclusions may not apply to you. However, in no event shall the aggregate liability to you or any third party for damages, losses, and causes of action exceed the amount paid by you in subscription fees or INR 1500, whichever is lesser. You agree to bring any and all actions within one year from the date of the accrual of the cause of action, and that actions brought after this date will be barred.